This house was built in 1884 by Frederick Driscoll and was designed by William Willcox. Its style, with gables and dormers is classic Queen Anne. Mr Driscoll was in the newspaper business, and also built the Pioneer Press Building at 4th & Robert Streets. In later years, it was headquarters for the Indianhead Council of the Boys Scouts of America. Frederick Driscoll House 266 Summit Avenue Originally on the site where this incredible High Victorian castle stands at 266 Summit Avenue, there was a much smaller house built in circa 1857 by Henry F. Masterson. 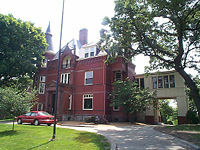 In 1884 Frederick Driscoll bought the property, had the home demolished, and started construction on his new $25,000 mansion. Built of pressed brick with stone decoration, the house was designed by William Willcox in the popular Queen Anne style. It is a picturesque example of the High Victorian architecture of the time, with its signature bays, dormers, and three-story tower. The original frame front porch was completely removed, and the new stone entrance added in circa 1910. The porte cochere was also an addition added in later years. Frederick Driscoll was in the newspaper business, and worked with J.A. Wheelock to form the Pioneer Press. Driscoll moved from his home on Summit Avenue to Chicago in 1900, and it was bought by lumber baron, Frederick Weyerhaeuser, who made it his private residence. Over the years the house has been remodeled several times, and portions of the interior are very much altered. It has been used in several different ways over the years, housing organizations and public groups, but is now again a single family home.